There is growing unease about the health of the Indian banking sector, and rightly so. While there is no one data point or event that is leading to this nagging feeling, there are lots of little signs which say that all is not well. Earlier this week, Usha Thorat, a former deputy governor at the Reserve Bank of India (RBI), wrote that Indian banks are the weak link in the Indian economy. Last week, a foreign brokerage talked about the increased exposure of banks to stressed firms. On Thursday, Mint reported on the serious concerns building over defaults from state electricity boards (http://mintne.ws/1I39KSM) . And these are just some of the more recent reasons to worry. The reported data gives enough cause for concern in itself. The concern is on all counts—stressed assets, weak earnings from operations and the investor perception around Indian banks. The stressed assets story continues to dominate the headlines. A grim reminder of why this is the case had come in the April edition of the International Monetary Fund’s (IMF) financial stability report. Many would have seen this but it bears repetition. 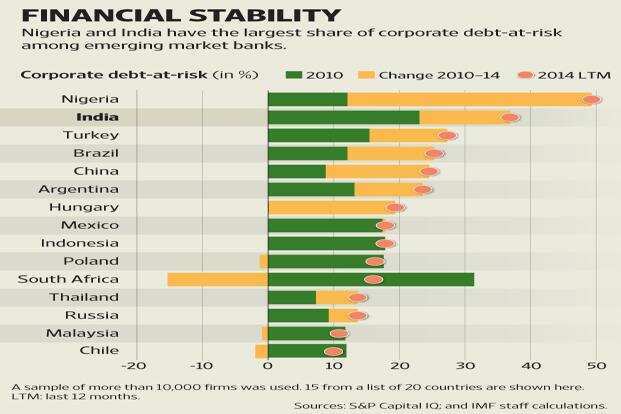 In a comparison of financial stability across emerging market banks, the IMF found that India has the second highest share of corporate “debt-at-risk". The IMF defines debt-at-risk as the share of corporate debt held by “weak firms" with interest coverage ratios (earnings before interest, depreciation, taxation and amortization, or Ebidta, divided by interest expense) of less than two. In India, corporate debt-at-risk was pegged at just under 40%. Nigeria was the only country found to be worse than India with close to 50% of debt lying with weak firms. While the data shows that most of the build-up of debt of these firms happened prior to 2010, there has been a further increase since then as well. This links up with a recent report put out by foreign brokerage house, UBS Securities, which has generated some controversy. The key takeaway from the report is that a number of banks have continued to lend to stressed firms, even after they were recognized as stressed. Based on an analysis of documents filed with the Indian Registrar of Companies (RoC), UBS deduced that loan approvals to stressed firms have risen 85% since the financial year 2012-13. Some banks have been more liberal in sanctioning such loans than others, said the report, drawing backlash from some of these banks. Without getting into that controversy, the point worth noting is that there is still a lot of potential stress in the banking sector, which could add to what is already visible in terms of reported bad loans. The other reason to worry continues to be the mediocre earnings of Indian banks. While one-off factors such as profits from treasury operations have kept earnings acceptable, the core operations of the banking sector are weakening. An indicator of this lies in the net interest income (NII), which is essentially the difference between the interest earned on loans and the interest paid on deposits. The Reserve Bank of India’s (RBI) Financial Stability Report, released in June, had some notable statistics. Growth in NII has fallen sharply over the past five years. For the year ended March 2011, when the economy was strong, NII growth was at nearly 35%. In subsequent years it fell to the 10-15% range. For the year ended March 2015, this fell further to 9.3%. The share of NII in the banking sector’s total operating income fell to under 70% last fiscal. Other ratios such as return on assets and return on equity have also been on the decline. Growth in NII is directly linked to the demand for credit in the economy and bankers will argue that they have little control over it. Though it is true, it also smells a little like lazy banking—a phrase popularized by former RBI deputy governor, Rakesh Mohan, in a 2002 speech. A third cause of concern is the investor perception of public sector banks. The June ended quarter saw foreign investors reducing their shareholding in most public sector banks—indicating perhaps they are giving up on the hope that the government will push for meaningful reforms in the banking sector. While the government has made all the right noises, and to be fair, made some important changes in the appointment process of top executives of state-owned banks, none of this is being seen as enough. A slightly half-baked change in the approach towards recapitalization of weak banks has also done a fair amount of damage. As a result, investors are left questioning how serious the government is about reforming the sector and whether it has the political will to take the tough decisions needed. Changing this perception is critical given the large amounts of capital that banks will need to raise over the next few years. A final (slightly tangential) thought—India’s banking sector is evolving like a two-speed economy. On the one hand, the sector is changing and modernizing rapidly as new banking structures and entities emerge and technology forces existing banks to change. On the other, legacy problems within the existing framework are acute and cannot be ignored much longer. Ira Dugal is assistant managing editor, Mint.